Lær kendskab til den perfekte billede af Paris på denne private vandretur, der kommer med en hurtig adgangskort til Louvre Museum. Begyndende på Île de la Cité, hvor den gamle by blev født, tager din egen guide dig på en 3-timers tur langs Seinen og deler indsigt i mange kendte landemærker som Notre Dame-katedralen og Eiffeltårnet. Dernæst går det ind i Louvre og omgår de lange indgangslinjer til en guidet 2-timers rundtur i kunst i verdensklasse, herunder 'Mona Lisa' og 'Venus de Milo'. Denne vandretur i det centrale Paris omfatter luksusbiloverførsler til Louvre for et ikke-ventetid guidet besøg, inkluderet optagelse. Oplev Paris, men uden folkemængderne i store tour grupper på denne private vandretur i byen. En informativ guide tager kun dig og din gruppe til en 3-timers tur, der starter ved epicentret i Paris - Île de la Cité - hvor den gamle by blev grundlagt. 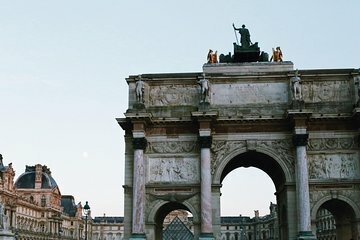 Få indsigt i Paris 'historie, arkitektur og kultur, som du ser landemærker og broer langs Seinen. Undervejs vil din guide påpege nogle hemmelige steder, der kun er kendt for lokalbefolkningen. Først beundrer du Notre Dame-katedralen, før du går videre til Pont Neuf og Pont des Arts, Musée d'Orsay, Orangerie-museet (Musée de l'Orangerie), Tuileries Garden (Place des la Concorde) La Madeleine, Champs-Elysées og selvfølgelig det uforglemmelige Eiffeltårnet. Genopfyld med frokost (egen regning) og så bliver du chauffør af luksusbil til Louvre. Kendt for sine lange indgangslinjer er Louvre et absolut must-do i Paris. Med din prioriterede indgangsbillet, sejler forbi linjen og hovedet lige indvendigt. Under en 2-timers rundvisning lærer du om betydningen, som Louvre holder for byen, og om dens historie som en fæstning og palads for franske kejsere, herunder Napoleon. Gaze på verdensberømte kunstværker og mindre frekventerede skatte, der ikke let opdages af de fleste besøgende, herunder Delacroix's Liberty Leading the People , Géricaults Medusa , Michelangelo's Dying Slave , malerier fra Frankrikes romantik og klassicismeperioder, Venus de Milo og originale fæstningsvægge . Og selvfølgelig er den eneste Leonardo da Vinci Mona Lisa . Efter museeturen er du fri til at udforske Louvre alene eller tage afsted på brostensgaderne i Paris og opdag de lokale ædelstene anbefalet af din guide. OVER THE TOP! Wish we could offer 10 Stars! Liliya our guide was EXTRAORDINARY! Words cannot express our gratitude for the time, education, and knowledge Liliya provided with us on Monday. In large part, she was the reason our trip was so amazing! Her ability to provide the historical details with a true storytelling-style and quality was exceptional--second to none. Her knowledge of Notre Dame and The Louvre was beyond exceptional! We honestly had no idea how much we would enjoy, value and appreciate the hours she spent with us. In addition to the walking tour she recommended restaurants, events and additional sites to compliment our planned itinerary. Every moment of our Paris journey was remarkable and it all truly began with this tour, with Liliya--we will always be grateful to her, for lending her wisdom, recommendations and French hospitalityit was exceptional! This was an incredible tour, and without a doubt exceeded our expectations. Our guide, Belen, was exceptional. She was of course very personable, polite, and thoughtful: she told us numerous times that we should tell her if she needs to speed up or slow down, to ask questions, etc. The amazing thing about her was how engaging she made the overall experience. She was clearly very passionate about the history of the city, and very very knowledgeable in topics ranging from history to architecture to art, religion and even Egyptology. Belen translated this passion into an engaging conversation with us, which made the whole tour feel like a true learning experience as opposed to simply memorize these dates and names because this is important per academia or popular for various reasons.The fact that she was quite funny also helped convey many of her points and material. This was a dense tour with lots of information, quite a bit of walking around Paris but not overwhelming, and inside the Louvre. Belen asked us about whether we wished to opt for a slower or more intense/fast pace to cover more ground. She suggested a few places to grab lunch, and offered some good advice about art galleries which we were after. We would highly encourage anyone to take this tour for an immersive and invaluable orientation, not only for first-time Paris visitors.